Dear Readers, apart from all the people who supported me during my studies in the ‘brick and mortar world‘, I’d like to especially thank YOU for following my website. When I started doing my research in 2007 the question of the legality of keyword advertising appeared in Austria to be very straight forward. The Austrian Supreme Court (OGH) in Wein&Co (OGH, 20.03.2007, 17Ob 1/07g) had ruled, without going into much detail, that the booking of a competitor’s trademark as a keyword on Google AdWords constituted per se an infringement trademark law as well as an unfair practise of competition. 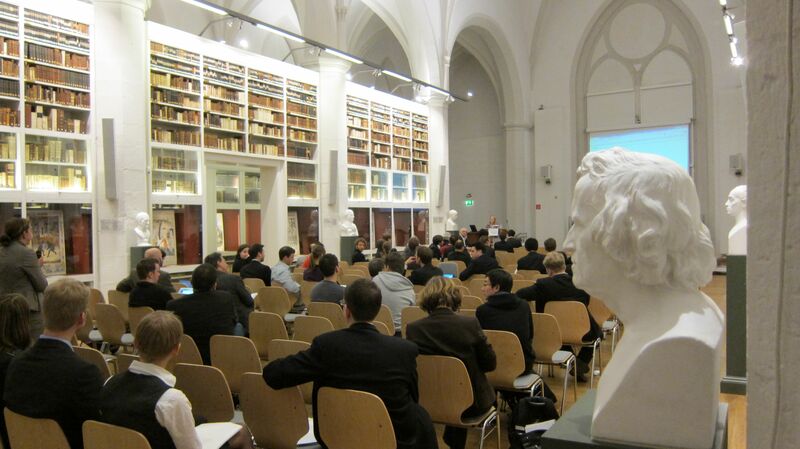 This post aims to provide a brief insight into some of the issues discussed at the conference “Suchmaschinen zwischen Informationsfreiheit und Wissensmacht“ (‘Search Engines between Freedom of Information and the Power of Knowledge‘) held at the Georg-August University of Göttingen on the 28th of January 2011 and the inaugural lectures of Prof. Dr. Torsten Körber LL.M. and Prof. Dr. Andreas Wiebe LL.M. held on the 27th. The Austrian Supreme (OGH) court ruled on the 21st of June 2010 in 17 Ob 3/10f BergSpechte, that even ads that don’t contain the third party trademark may lead to a likelihood of confusion. As a result the advertiser violated § 10 (1) Z 2 MSchG (= Art 5 (1) lit b ECD = § 14 (2) Z 2 dMSchG). To my knowledge the Austrian court is the first national court to render a decision based on the ECJ’s keyword advertising decisions. The court based its reasoning on the fact that the advertiser had failed to rule out any likelihood of confusion by adding ‘appropriate clarifying indications‘. The (Display-)URL shown below the ad of the defendant (‘www.trekking.at‘) was however the decisive issue in the case as the court found that this (generic) URL would make it ‘appear more likely ‘ for an internet-users to assume that a connection between the ad and the TM-owner or a entity economically connected to the TM-owner exists, as both search terms used (‘Edi Koblmüller‘, ‘Bergspechte‘) were highly original and did not at all describe the services advertised. As a consequence the court ruled that a likelihood of confusion existed. As the decision only deals with the admissibility of an interim injunction the attorney of the defendant, RA Dr. Michael Wukoschitz, has called the ruling a Pyrrhic-victory as the defendant was not generally forbidden to use the TM of the claimant but only forbidden to use it in a misleading way. As the court has found that the ads in question (please see illustration/image below) are deemed to be misleading this might only be a small comfort. Taking into account that the OGH’s decision might have been a different one if the claimant had used a non-generic but very distinctive URL, it remains to see how the OGH will decide in such a case. The decision itself is quite surprising, especially in the light of Google’s recent policy reform and the fact that the German Supreme Court (BGH) found that it would be ‘far fetched’ to assume that users would establish a connection between their search queries and the ads displayed (para 19 BGH, I ZR 125/07, Bananabay, GRUR 2009, 498). Looking at the decision itself, it soon becomes obvious that it comes from the same judge who has already made an unfortunate ruling in the Wein&Co case, which was equally questionable. What especially strikes me is the how easily the court established a likelihood of confusion. This is especially so as the ads were aiming at mainly young people who plan to travel the world ‘off the beaten tracks‘ and I do think it is questionable that someone who is planning to cycle through Ethiopia on his bike won’t pay a bit more attention to the search results when preparing the trip. But well, it still seems that the Austrian Supreme court sticks to an average Austrian internet user who is probably best described as fairly internet-illiterate or at least far from being web-savvy. Furthermore I wonder what an ad would need to look like not to confuse and average Austrian internet user. What is the advertiser does not have a (distinctive) domain which clearly indicated him/her as being a separate entity and moreover, not economically connected to the TM-owner? So it might be a good thing that the OGH considered the Display-URL but its conclusion somehow fail to convince. Should the Display-URL be really the decisive factor? What about all the happy second-domain-owners which own e.g the much sought-after domains www.laws.at, www.sarcasm.at, http://www.bike.co.uk or other generic terms. Should they be disadvantaged when using keyword advertising? I think the decision still has got its flaws and is based on an internet-illiterate user, but on the positive side, for once the court was forced by the ECJ to at least finally get the separation between the search results and the ads right (para 1). That’ at least some progress! The second positive issue is that the court declined the plaintiffs claim to generally forbid the plaintiff to use its trademark. So yes, the use of third party TM as keywords is also allowed in Austria, only problem, nobody can tell advertisers under which conditions…. lots of culture. Sixteen days from 20.10. 10. Im vorliegenden Fall geht es um zwei Anzeigen, von denen eine bei Eingabe des Suchwortes “Eid Koblmüller” aufgerufen wurde, die andere bei Eingabe von “Bergspechte”. In beiden Anzeigen wird für Reisen geworben (“Trekking- und Naturreisen zu den letzten Berggorillas oder Wandern auf alten Pilgerrouten”, “Äthiopien mit dem Bike, Traumreise durch den Norden mit viel Kultur, 16 Tage, ab 20.10.”). In keiner der beiden Anzeigen wurde durch einen entsprechenden Hinweis klargestellt, dass keine wirtschaftliche Verbindung zwischen der Klägerin und der Zweitbeklagten besteht. Angegeben waren jeweils nur die die Internetadresse der Zweitbeklagten (http://www.trekking.at), die aufgrund des verwendeten Gattungsbegriffes keine Zuordnung zu einem bestimmten Unternehmen erkennen lässt. Gegenstand des Angebots waren jeweils Outdoor-Reisen, wie sie auch die Klägerin anbietet. 11. Für einen normal informierten und angemessen aufmerksamen Internetbenutzer war damit nicht zu erkennen, dass die Anzeige von einem Anbieter stammen, der mit der Klägerin in keiner Weise wirtschaftlich verbunden ist. Es lag für ihn vielmehr nahe, das Gegenteil zu vermuten, weil beide Suchworte ein hohes Maß an Originalität aufweisen und die angebotenen Dienstleistungen nicht einmal ansatzweise beschreiben. 12. Der normal informierte und angemessen aufmerksame Internetnutzer konnte daher annehmen, durch Anklicken der jeweiligen Überschriften auf Seiten zu gelangen, die, wenn nicht von der Klägerin, so doch von einem ihr wirtschaftlich verbundenen Unternehmen betrieben werden. Der dadurch begründeten Verwechslungsgefahr hätten die Beklagten durch entsprechende Gestaltung der Anzeigen, wie etwa durch Aufnahme eines aufklärenden Hinweises, entgegenwirken müssen (s Anderl, Anm zu C-278/08 – Bergspechte II, ecolex 2010, 477f; Stadler, EuGH: Google verletzt mit AdWords keine Markenrechte, MMR Fokus, MMR 5/2010, VIII). 13. Als Zwischenergebnis ist daher festzuhalten, dass die durch die Verwendung einer Marke (eines Markenbestandteiles) als Keyword generierte Werbung eines Dritten (der Beklagten) in die Recht des Markeninhabers nur dann nicht eingreift, wenn aus dieser Werbung für einen normal informierten und angemessen aufmerksamen Internetnutzer leicht zu erkennen ist, dass die in der Anzeige beworbenen Waren oder Dienstleistungen weder vom Inhaber der Marke noch von einem mit ihm wirtschaftlich verbundenen Unternehmen stammen. UPDATE (22.08.2010): The Austrian court has published the decision. I placed a link to the document at the beginning of this post. It does feel a bit like Christmas. Although the blogosphere seems to continue hibernating the increase in searches for the upcoming ECJ decision leaves little rooms for doubt that we all are quite excited about the decision expect for around 08:30 Vienna time. From previous publications of the ECJ I know that the press is usually informed first which means that we are deemed to wait until the document will be released at around noon. If you can’t wait (Impatient You!) feel free to click on this link >>here<< to check the Curia website. But before we all freak out and try to speed read through the decision, trying to be the first blog indexed by Google to contain a summary of the judgement I’d like you to step back on last time and to think about which questions the upcoming decision might answer. – Shall be see the keyword advertising process as one single process, or will the ECJ follow Maduro’s concept of splitting it into a “booking” (no sale of goods) and a “displaying” (no likeliness of confusion) steps? – Will the ECJ decide on the liability of Adwords alone or will it decide about “both sides of the coin“. – Will the court also consider the much litigated “Keyword Suggestion Tool“? – Will the court eventually come up with something like a duty for Google to check if the term the advertiser is about to book has been registered in the respective target area. If yes, shall Google also check if the Nizza classes of the products and services of the advertiser and the TM-holders are the same. (The second sentence is a joke). – Will the follow the arguments of the GA concerning the fact that web users do have the capability to differentiate between an ad and the website of the trademark holder or a licensee? – Will the court eventually consider the display of search results and ads in detail, establishing kind of guidelines concerning the placement etc (or Google’s design change in 2007, changing the background colour or Top-Ads)? – Will the court also try to close all the litigation loopholes in national law (telling the courts to stop applying their national civil law, criminal law or law of unfair competition onto keyword advertising cases)? – Will the court follow the French terminology or will it follow the GA’s terminology, describing ads as “ads” (above or besides the search results), the organic search results as “search results” and ads which are shown inside the list of search results as “paid placement” or “Keyword Buying“? – Will the court follow the suggestion of national courts to establish the protection for the advertising and the communication-function of famous trade marks? – Will the court consider the different levels of protection for trade mark holders in Europe? Will French, German and Austrian trade mark holder can still oppose against the sale of their TM as a keyword, English TM-holders can’t. – Will the ECJ finally deliver a feasible and reasonably easy to understand definition of the term “trademark use”? – Will the ECJ find Google’s search engine service to be covered by the provider liability exception? If yes, what about AdWords and the fact that Google is one of the few search engines now (already) displaying ads on their query page? Tags: Cadbury, Cadbury Yahoo deal, Google, Overture, Yahoo Search Marketing, Yahoo! Internet publisher Yahoo.com is cooperating with customer loyalty scheme Nectar to connect users’ (offline) shopping profiles with (online) user accounts so as to subsequently utilize this information for perfectly targeted online advertising campaigns. Nowadays as well as in the past, users surfing on the net are exposed to ads coming from a multitude of providers, all trying to gain consumers’ attention and – of course – his/her personal data in order to eventually deliver tailored ads. At my presentation in Salzburg, I’m presenting an idea according to which a consumer/user signs up at an “Advertising Provider” and in exchange for providing this provider with his personal details and the ability to fill all the advertising space in his browser while surfing, the consumer will be compensated for this by some sort of incentive (money, loyalty credits, etc.). This idea incorporates elements from the “Peter Pays” business idea, where users can make calls from their computer to foreign land-lines for free (! ), but they have to watch ads while they are on the phone (and they have to prove that they’ve actually watched them by answering simple questions about the ad afterwards). There might, however, also be a couple of advantages for users and advertisers: First and foremost, the data provided will enable perfectly tailored advertising, making ads more interesting for consumers, while at the other hand also reducing the advertising costs for advertisers. Secondly, the fact that all the data is stored in one single place might also present some benefits. First of all there is one single opt-in, instead of many opt-outs. Secondly, as the data is stored in one place it might also make sense to address the provider, asking for a copy of the data held and/or ask the provider to change/rectify the data. This might sound naive to some readers, but the Austrian Data Protection act is very fine piece of legislation, grating the consumer e.g. the right to request a copy of all the information held about him once a year for free (please see my post on about how I’ve tried this myself.) Secondly I wonder if that provider, being the target of public criticism, wouldn’t be under much more scrutiny to prevent data leaks than e.g. any small loyalty program or online newspaper you have signed up for. While preparing my presentation already a month ahead of the IRIS2010, I was only speculating about such a system. Reality however has “overtaken” me and today at the day of the presentation there is already such a programme, interconnecting offline identities with online accounts to deliver tailored ads. The British, are -apparently- a nation that was fortunate enough never to have suffered under a government who has abused personal data for bad purposes. Thus, it did not come as an surprise to me that customer loyalty schemes provider Nectar and Yahoo! are using British consumers to perform the marketing masterpiece of connecting a offline consumer with an online (Yahoo!) account. Nectar offers its services (“Consumer Connect”) for a wide range of shops and one can only imagine the wealth of data available in their database. Nectar partners starting with an "A"
Consumers, opting into the service “Consumer Connect” will then be supplied with ads, matching their online, as well as their offline- behaviour. Yahoo and Nectar however have of course pointed out that Nectar accounts are linked to their Yahoo! profiles without revealing personally-identifiable information. Although I see no particular reason to distrust Yahoo!’s statement, I’d like to follow my credo that “people aren’t no good” & “what can be done, will be done“. I am almost amused by the thought that while some users are heavily protesting Google Streetview etc. more than 20.000 Nectar customer’s have already sold their privacy for the mere price of a chocolate bar. Besides the fact that the videos are both “kind of funny”, both definitely also touch some serious points (e.g. last sentence in the second video: “If you have a question about the Google […], type it in an email to a friend and Google will come back to you within 24hrs“). The Austrian OGH got two different interpretations/meanings of a technical term mixed up in its Wein&Co decision, thus its decision is not conclusive. 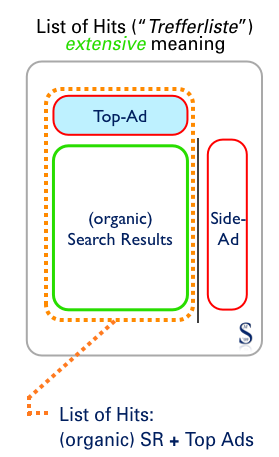 As a consequence, Austrian and German authors (Noha and Baars/Troge) have argued that the OGH might actually have generally misunderstood the nature of Keyword Advertising, as the OGH at some point argues that Google displays ads within it’s (organic) search results (= Paid Placement). I partly disagree as I argue that the court got the basics right and that the basic ratio of the decision is not utterly mistaken, but that the court at some point confused the two terms “Trefferliste” (List of Hits) and “Suchergebnis” ([organic] Search Results) and thus has delivered a partially inconclusive decision. For further observations about other possible (visually misleading) influences onto the court please refer to my previous post. “Suchergebnis” = (organic) Search Results: These are the results provided by Google. The court of first instance describes the whole Ranking Process quite well (p.7 et seq). “Trefferliste” = List of Hits (broad meaning): This term describes the left side of a SERP (Search Engine Results Page), which consists not only of the search engine’s (organic) Search Results, but also includes Top-Ads (Ads on the top-left side, displayed against a (pre April 2007) light blue background, bearing a sign, marking the light blue section as being a “Anzeige” (sponsored Link)). The OGH uses this (broad) interpretation in the beginning of its decision, but notes however that the labelling of the ads by Google is “more or less” clear. Things however got complicated when the OGH returned to its earlier understanding of the term List of Hits as a synonym for the much narrower term (organic) Search Results. The OGH itself has repetitively used the narrow interpretation in e.g. its Numtec-Interstahl and its Glucochondrin descision. Please see below that the OGH has put the word “Trefferliste” in brackets behind the word “Suchergebnisse” which I see as an indication that the OGH, as opposed to the lower courts, sees the List of Hits to be the same as the (organic) Search Results (narrow interpretation). The lower courts in Wein&co had mostly used the broad interpretation. In 3.4 the court also states that the AdWord was displayed immediately above the List of Hits (“Trefferliste”). As there are usually no further ads or banners above the Top-Ads, I take this as another indication that the court saw the List of Hits to be the same as the (organic) Search Results. The court used the broad interpretation to be able to include Top-Ads into the List of Hits. The court subsequently however applied the narrow interpretation in relation to the question of the likeliness of confusion and thus saw/treated Top-Ads to be a part of the (organic) Search Results.[!] I agree with the court that users expect to see search results inside the (organic) search results which have been ranked in accordance with fair and relatively unbiased algorithms. 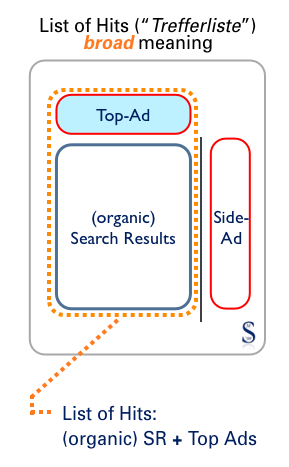 Thus, the display of ads inside the (organic) Search Results would increase the likeliness of confusion. 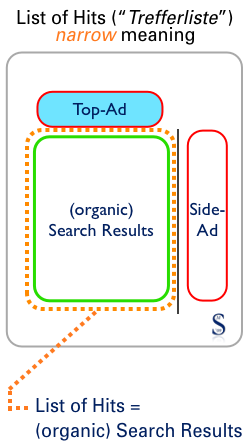 However, the way with which the court expressed itself in the decision incorrectly suggests that Google engages in Keyword Buying (= Paid Placement = selling ad space within its search results). The source of all this confusion obviously lies in the different ways the plaintiff and the defendant used the term “Trefferliste“. While the plaintiff, represented by Dorda Brugger Jordis, used the broad interpretation to back up its (Paid Placement) claim, the defendant, represented by Ferner Hornung & Partner, used the narrow interpretation to back up their claim (please compare p. 2 last paragraph, first sentence and page 5, second praragraph, last sentence of the HG’s decision). The court in Wein&Co however, as opposed to the lower instances, apparently got the terms List of Hits and (organic) Search Results mixed up and thus reached a result which is partly not coherent. The decisions of the lower courts in the “Wein&Co” case can be downloaded as PDFs by clicking onto the respective link. HG Wien_34Cg 70/05h_27.12.2005; OLG Wien_2R 28/06m, 27.07.2006. [The court of first instance (HG Wien) used mainly used the more precise term “Suchergebnisse” but also the terms: “Ergebnisliste” (p.10) and “Trefferleiste“[sic!] (p.26) in both interpretations (narrow p.5, broad p. 10); The court of second instance (OLG Wien) was far less clear and used the phrase “bei den Trefferlisten” which could be translated as “next to the List of Hits“. 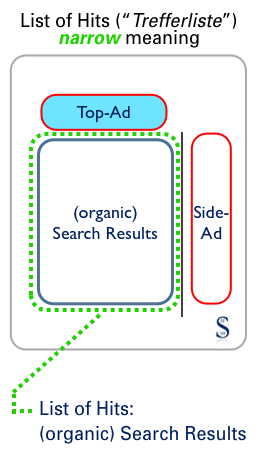 However, also the court of second instance saw the ads to be above or beside the (organic) search results thus used the broad interpretation. The German BGH however, also applied the “narrow“ interpretation of the term “Trefferliste” in his Bananabay-decision. The Austrian OGh however, used the term “Trefferliste” in its Bergspechte decision in the narrow meaning again. In the text of the reference the court referred not only to the term “Trefferliste” but also circumvented the issue by speaking more vaguely abut “ads […] displayed on the screen“.